A common question that many of my clients ask me is why the interest or inflation rate in your reserve study is different than the current rate. The reason is that a reserve study is a 30 year projection and those rates are used to estimate costs and reserve account balances over the next 30 years. While today’s interest and inflation rates may be very low, over a 30 year period they are going to go up and down. So it is best to use an average conservative rate when performing a reserve study. 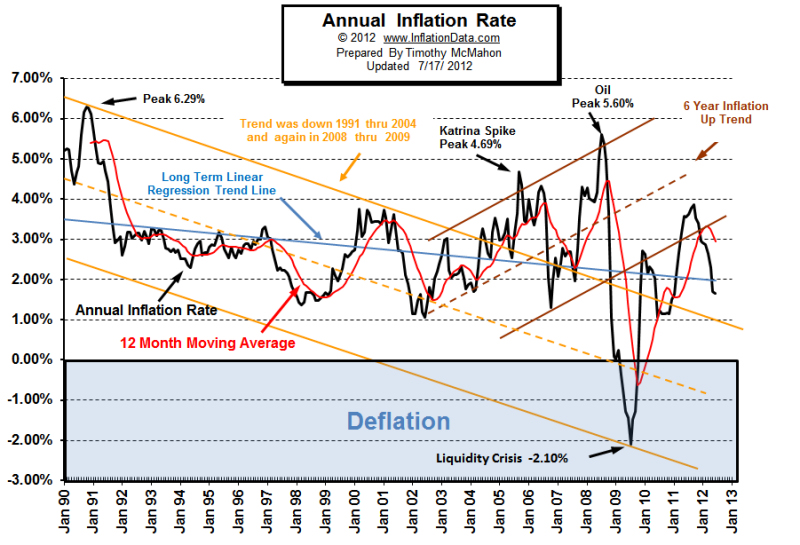 The following chart shows inflation over the last 23 years. You can see how it goes up and down but the blue regression line shows that it averages out to about 3%. A common misconception is that interest and inflation will cancel each other out so they don’t need to be considered in a reserve study. Interest and inflation do tend to follow each other up and down over time so they should be kept similarly close in a reserve study. But, the unfortunate truth is that inflation in reserve studies greatly outweighs interest over time when it comes to reserves. The reason for this is that inflation affects the total cost of replacing your reserve component. In contrast over time you are slowly building up the cost of this replacement in your reserve account so the interest is only being applied to a percentage of this replacement cost. In addition to that almost no associations are always 100% funded over a 30 year period. In fact, many use a cash flow plan and their percent funded can be very low at times. This means there are periods of low balances in your reserve account and you are earning very little interest while the inflation rate is compounding on the full cost of your expenses. Associations that have a low reserve balance often are earning very low interest rates if they are earning any at all. So interest and inflation should always be considered in a reserve study. One other item that should be used in a reserve study is annual dues increase percentage. I typically recommend this be similar to the inflation rate. The reason this should be used is because again, a reserve study is a 30 year projection and it’s obvious that an association’s dues will not be the same now as they will 30 years from now. So this variable is used to keep up with inflation over time.